We are looking forward to another year of creative reuse! We will be closed December 22nd and 29th for the Winter Break, but come visit us on January 5th 2019! More LOOSE PARTS! Inspiring learning for infants and toddlers. More Galleries | Comments Off on More LOOSE PARTS! Inspiring learning for infants and toddlers. 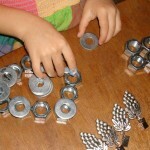 Posted in Uncategorized	| Comments Off on Celebrate LOOSE pARTs! Posted in Uncategorized	| Comments Off on Take Some Time for Yourself!